On this small group tour, you experience the highlights of Southern Africa. From Windhoek, your journey leads you to the dunes of the Namib Desert. You visit the coastal town of Swakopmund, explore the the impressive rock formations and terraces of Damaraland and experience the exciting wildlife in Etosha National Park. Travel through the lush green Zambezi Region and its remote and wild national parks. Chobe National Park famously rich in wildlife awaits you in Botswana before you end your journey at the impressive Victoria Falls. Take a break from the rest of the world and join us on a journey of discovery to some of the most beautiful places in Southern Africa. Together with our professional local guide, you will see beyond picture-perfect sunsets. Upon arrival at Windhoek International Airport, you will be welcomed by your transfer driver and taken to your guesthouse in Windhoek. You have time to relax and refresh before you meet your guide in the afternoon. On a city tour around Windhoek, your guide will introduce you to the capital of Namibia and show you sights such as the Christ Church, the parliament known as ink palace as well as Independence Avenue. At the extravagant Joe’s Beerhouse, you have dinner with your fellow travellers (own expense). You spend the night at Vondelhof Guesthouse. After breakfast, your journey begins. You make your way south. At the small town of Rehoboth, you leave the tarmac road and continue on dirt road across beautiful landscapes to the Namib Desert. In the afternoon, explore Sesriem Canyon in the Namib Naukluft Park. This roughly one kilometre long and 30-metre deep canyon was formed millions of years ago by the Tsauchab River. During dry season you can take a walk through sections of this canyon, marvelling at its steep walls reflecting the sunlight and making for great photos. Afterwards, you drive to Elegant Desert Lodge, where you will stay the night. 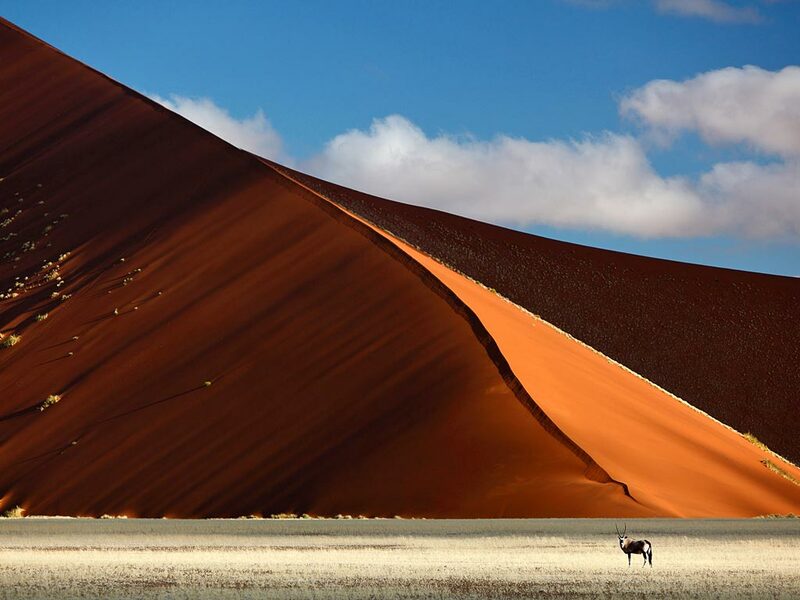 In the early hours of the morning, you return to the Namib Naukluft Park. Look forward to a morning in the dunes of the Namib! Walk to the top of the famous Dune 45 and enjoy the unforgettable view across the seemingly endless sea of dunes – the somewhat challenging and sandy walk up is certainly worth it. 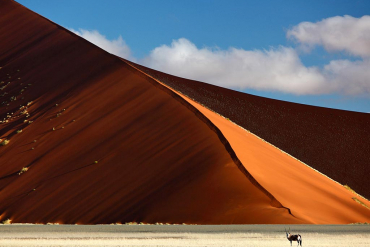 You visit the well-known Sossusvlei and Dead Vlei, where the colour contrast of the white clay pan, rust-red dunes, and dark blue sky is spectacular. You continue north towards Namib’s Valley. Your rustic lodge by the same name is situated on a terrace overlooking the desert valley. You spend the night at Namib‘s Valley Lodge. You make your way towards the Atlantic Ocean. Together with your guide, you drive through the Tinkas Mountains, passing the Bloedkoppie and along the Welwitschia Drive into the Moon Landscape, south-east of Swakopmund. This alien but at the same time fascinating landscape with its bizarre, rugged rock formations fascinates nature lovers. You now reach the charming coastal town of Swakopmund. On a walk, learn about the town’s history and visit the old train station as well as the Woermannhaus. You can spend the following day at your leisure. Stroll around town and along the promenade or browse the shops. Or join one of the many activities offered: go on a boat cruise or desert safari tracking the Little Five (optional). At night, join your fellow travellers for dinner (own expense), the choice of restaurants is plenty. Your home for these two nights in Swakopmund is Namib Guesthouse. After an early breakfast, you’ll be on your way. Along the coast, you drive to the Zeila wreck, one of the many stranded shipwrecks, where you stop for a photo and viewing break. You leave the coast behind and continue inland to the great Brandberg Mountain. Accompanied by a local guide, hike to the “White Lady”. See this and other famous rock art, true cultural treasures of Namibia. You now make your way to the Ugab Valley. This picturesque area impresses with its table mountains and high plateaus, the so-called Ugab terraces. If time allows, you stop at the Herero Craft Market along the way. At Vingerklip Lodge, you end your day. Enjoy the brilliant views and a delicious dinner. A short morning hike leads you to Vingerklip, an impressive rock formation resembling a finger. 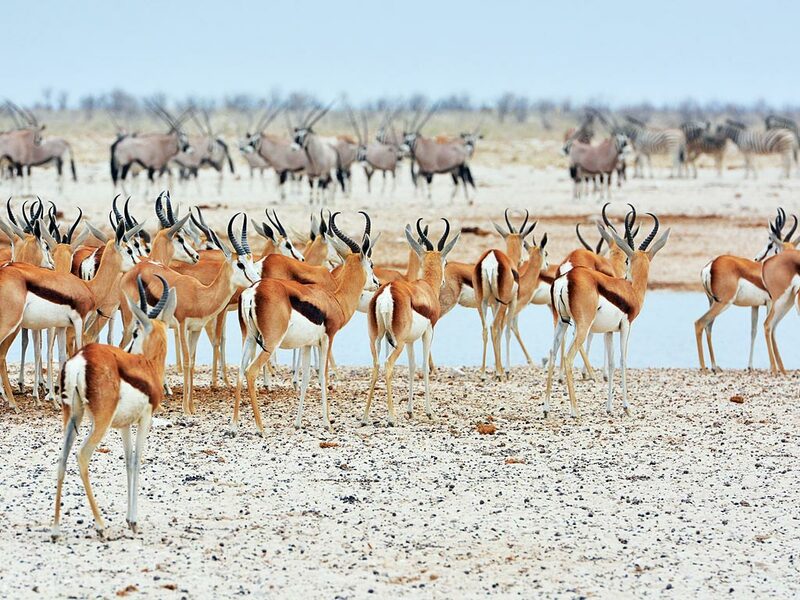 Now it’s time to head to the next highlight of your tour: Etosha National Park. The coming days are all about “safari” in one of the most popular national parks in Southern Africa. Together with your guide, you look for elephants, lions, rhinos, zebras and different kinds of antelopes. Stop at waterholes to watch the animals quench their thirst, while your guide shares their in-depth knowledge about the fascinating world of wildlife with you. You reach Okaukuejo Camp, where you will spend the night. At the night-lit waterhole, you can even look out for animals during the night. Tonight, you enjoy a traditional potjie pot dinner prepared by your guide on the campfire. To watch nocturnal animals in the park, we recommend a guided night game drive (optional). After sunrise and a hearty breakfast, you go on more game drives. 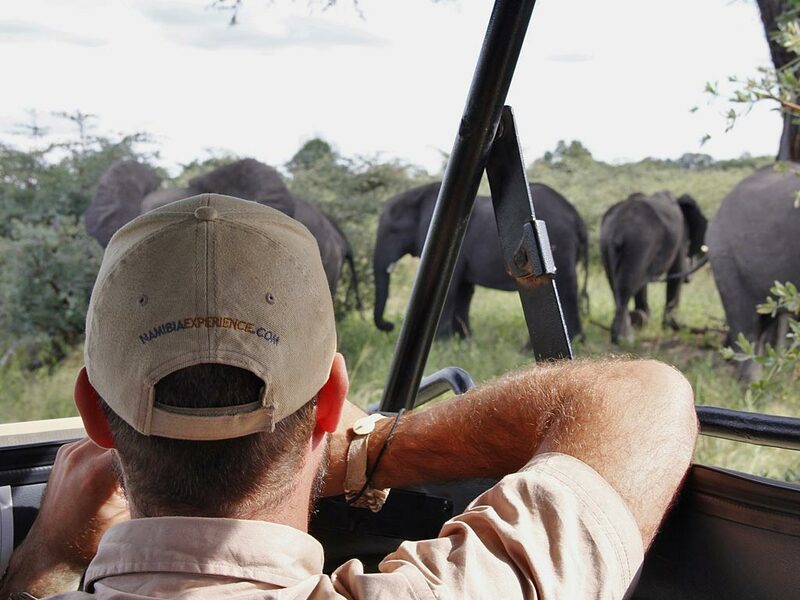 No day on safari is ever the same so you can look forward to an exciting day in nature. Herds of impalas, wildebeest, oryx, and zebras cross the Etosha Pan, stretching for kilometres on end in eastern direction. You stop at waterholes to watch the animals and learn about their habitat and behaviour from your guide. In the late afternoon, you leave Etosha National Park at Lindequist Gate and reach Mushara Bush Camp after only a short drive, your home for the night. Great safari memories on your mind you continue your journey. You visit the inland lake Otjikoto and the Hoba Meteorite before making your way to the home of the San. At an open-air living museum, resembling a traditional village of the Ju/’Hoansi San, learn about the traditional hunter-gatherer culture and traditions. Have a go at making a fire, setting traps or building bow and arrow. Even prepare and try a traditional bush meal. After this exciting and educational experience, you drive to Fiume Lodge where you will spend the night. You continue North. Thatched clay huts line the road, the vegetation turns thicker and greener. A quick shopping stop is made in Rundu, the economic centre of the Kavango Region. Experience the bustling activity of the market where local fishers and farmers offer their produce. You continue to reach your home for the night, a little oasis at the Okavango River. Enjoy a cold Rock Shandy at the island bar and relax before you go on a sunset cruise on the river. With a little luck watch hippos and crocodiles and let the magical scenery sink in. For dinner expect a traditional braai, a BBQ. Enjoy the evening around the campfire and listen as the nightly bush concert begins. You spend the night at Mobola Island Lodge. 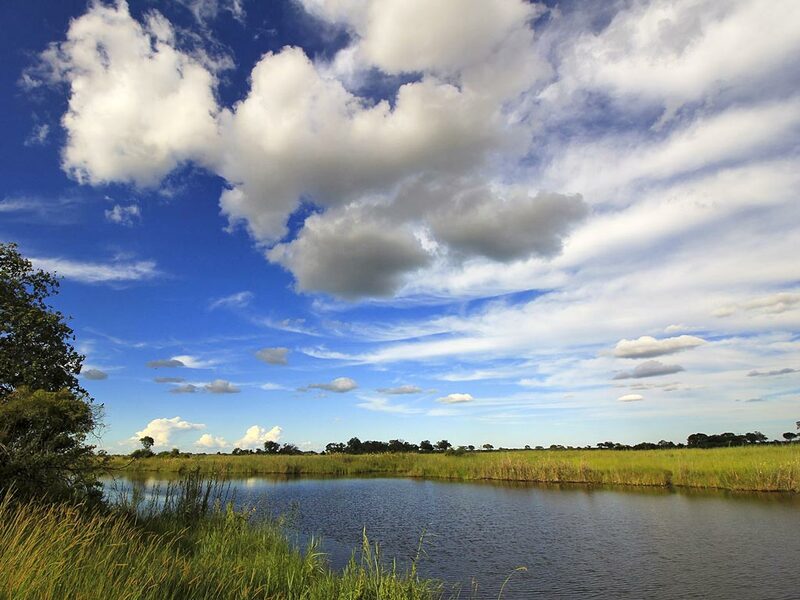 You continue into the Zambezi Region, passing fishing and farming villages. You might even spot big game crossing the road. Your destination is the Nkasa Lupala Tented Lodge, your base camp for exciting safari adventures for the next two nights. Together with your guide, explore the remote and wild national parks of the area. The Nkasa Lupala National Park, formerly known as Mamili National Park, is known for its swamps and marshes. Elephants, buffaloes as well as red lechwe and reedbucks roam the area in large herds. Lions, leopards, zebras, and even the rare roan and sable antelopes call this region home. Neighbouring Mudumu National Park awaits you for more unique safari moments. Since both parks are off the beaten track and not fully developed, expect to drive on bumpy 4×4 tracks. Together with a local guide you will also go on a sunset boat cruise. Hippos and crocodiles live in the rivers and channels, and the bird life is especially varied. You spend two nights at Nkasa Lupala Tented Lodge. It’s time to leave Namibia and cross the border into Botswana. At the outskirts of Kasane, you check into a typical safari camp. After a light lunch, you focus once again on wildlife sightings. Accompanied by a local guide, the next two days will be spent on extensive game drives in an open safari vehicle around Chobe National Park and on a boat safari on Chobe River. With more than 40,000 elephants, Chobe National Park is home to one of the largest populations of these gentle giants in Southern Africa. You can even spot all of the Big Five. Look out for large buffalo herds, prides of lions, leopards, and other big game, while exploring the different areas of the park. Change your perspective and look for crocodiles and hippos on your boat safari as well as for animals coming to drink at the river. Spend two nights at Tlouwana Camp. After breakfast, you will be taken across the border to Zimbabwe. 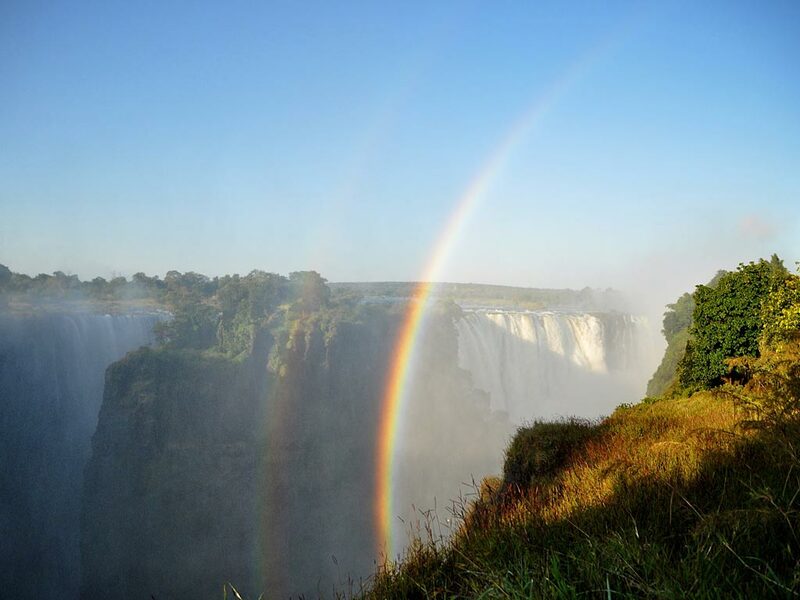 The town of Victoria Falls is your destination. On a leisurely walk, you explore the “Mosi-oa-Tunya”, the smoke that thunders. The Victoria Falls are the second largest waterfalls in the world. The mighty Zambezi thunders across a width of nearly two kilometres, down more than 100 metres – an impressive srayview Lodge. Exciting memories on your mind your trip ends today. Say your goodbyes to your guide and fellow travellers before we take you to the airport. From here you can either return back home or continue your travels. We are happy to assist you in organising your onward travels in the region. What can I expect from a lodge safari ? A lodge safari is a journey along a well-planned route, through the wide expanses of Namibia on tar and gravel roads. You will get to see impressive landscapes, experience game viewing and gain an insight into the different cultures. In order to experience Namibia in all its facets, long driving distances are inevitable. On a lodge safari, all accommodations offer rooms with en-suite bathrooms as well as a comfortable atmosphere and personal service. Who is suitable for a lodge safari? A guided lodge safari is suitable for individuals who want to feel Africa and experience its splendid nature and wildlife while travelling in comfort and ease. The groups consist of a minimum of two and a maximum of six people. Not only couples and friends, but also solo travellers join our guided lodge safaris. Clocks tick differently in Africa and unexpected hurdles can arise on the way. Flexibility, patience, an open mind as well as a good sense of humour are the key to an enjoyable trip and an unforgettable experience. Who is the guide and who drives? Your qualified and registered guide is also your driver. Our guides know the fauna, flora, people and roads of Namibia like the back of their hand and have many years of driving experience on gravel roads. Our guides have a passion for Namibia and love nothing more than sharing interesting facts and stories about the country. Namibian food is a combination of African and European styles. The latter is often German cuisine – pork dishes, potatoes, breads and pastries. Dishes with game meat, beef and lamb are very popular. Seafood is also regularly on the menu. Biltong (cured, dried meat) and droëwors (dried sausage) are typical Namibian snacks. All lodges serve a full breakfast, most include a 3-course dinner as well. In some towns there is the option to have supper at a restaurant (own account). What is a typical day on a lodge safari like? A normal day will start with breakfast at around 8am and end with supper at around 8pm. It might happen that you have an early morning activity planned, so breakfast might be slightly later or a packed breakfast will be provided. In general, departure times are quite flexible and can be arranged in consultation with the guide and the rest of the group. As your guide knows his or her way around and is familiar with the driving times and distances, he or she will decide what time to leave. You will either travel to your next destination or explore the surroundings on excursions. You arrive at the overnight accommodation in the afternoon, with some time to relax and freshen up before supper. After supper, you might want to chat and enjoy a night cap before you go to bed. You will overnight in guesthouses, guestfarms, lodges or permanent tented camps. While guesthouses, guestfarms and lodges consist of permanent buildings, tented camps provide accommodation in large walk-in tents with en-suite bathrooms, including washbasin, shower and toilet. The standard is 3-star to 4-star. Most accommodations are nestled in beautiful scenery and offer spectacular views. Although the tour price includes most meals, entry fees to national parks and accommodation, you still need to plan for other expenses. Plan for optional activities (game drives, boat trips, cultural visits etc), tipping, souvenirs, extra meals and drinks. Tipping in Namibia is a reward for good service and is at the guest’s discretion. Normally you can add 10% to a restaurant bill. For lodge staff, there is generally a communal tip box. If you want to tip your Namibia-Experience guide, we recommend 150 – 220 N$ per group per day. 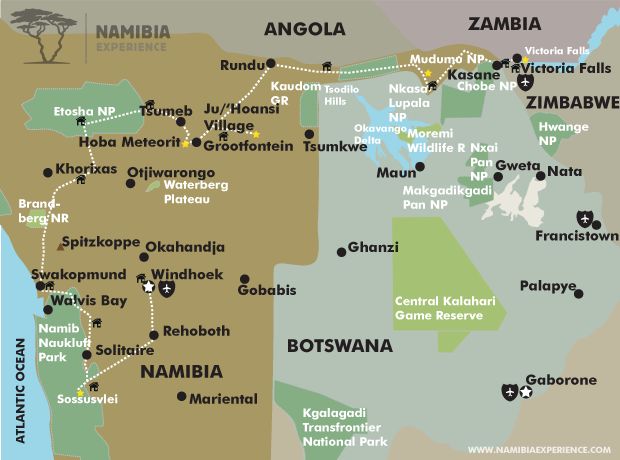 The currency in Namibia is the Namibian Dollar (N$) and is traded at 1:1 to the South African Rand. South African Rands can also be used as payment in Namibia. You can draw cash at a local ATM with your credit card or Maestro card (PIN required). Transaction fees depend on your bank and the establishment which you are using it at. In many big shops/shopping malls you can pay with credit card. At smaller shops and at some fuel stations you can only pay cash. Furthermore, we recommend having cash for emergencies and small purchases such as curios or at markets as well as for tips. Also have cash for tipping as some accommodations will not add the tips onto your service bill. It is recommended that you have your regular vaccinations updated – tetanus, hepatitis A and B and polio. Malaria is a concern in some areas and we therefore recommend that some precautionary measures are taken. For more detailed information on prophylaxis and the effects as well as possible side effects, please contact your doctor, travel clinic or tropical institute. No smoking is allowed in the safari vehicle or in the rooms. While on the road, there will be frequent stops for smoking and bathroom breaks. When travelling anywhere, basic safety measures apply. Do not carry large sums of cash, be careful of your cameras, cell phones and jewellery and never leave valuables lying open in the safari vehicle. Carry cash and travel documents in a pouch on your body or leave in a lodge safe. Do not walk alone at night and be especially cautious when drawing money at an ATM. When in doubt, ask your guide. Different safety measures apply when on a game drive in the bush. Always stay in the vehicle and only get out at designated picnic stops. Our safari vehicles have pop-up roofs to allow for safe photography – never get out of the vehicle to get closer to animals for a better photo. Wild animals can be dangerous, even if it does not look like it. Please do not feed the animals or remove plants, flowers, seeds or stones.